Five strangers dropped alone on a mysterious island littered with strange debris and horrific creatures. A cabal of five powerful shadowy men controlling the life and death "Trials" of these poor souls. This is the world of "The Preserve". In season 1.0 (Episodes 1-6) we are introduced to the individual players in our drama. This was not what I expected though I really wasn't sure what it was about to begin with. Written as if it were a made for television reality series, it takes a bit to realize the evil taking place against the unwilling captives has been created by beyond-rich men with a hunger for something unique to satisfy the neverending lust in their hearts and minds. The story is very short but seems to cover a lot of ground without bogging down in detail. I'm not really sure how to rate it as I've nothing to compare its style with other than TV or a movie. The narrator was excellent and I would enjoy hearing more of her work. I must admit that while I might not normally read something with this kind of plot, I'm hooked so I must wait for the next book in the series. There is graphic adult language but so far very little adult content. I received this book as a free gift from the narrator and Audible. Thank you. What did you love best about The Preserve: Season 1.0, Volume 1? Interesting characters. It has me wanting more. I like this type of novel with some the characters having to meet challenges, with unforeseen twists along the way. 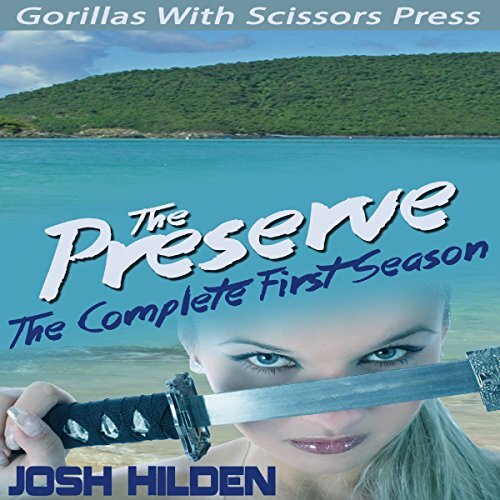 What other book might you compare The Preserve: Season 1.0, Volume 1 to and why? The Hunger Games. In The Preserve, you have characters put in a situation where it is be smart, adapt, and fight to survive. The ultimate game. What about Karen Krause’s performance did you like? Karen Krause's performance is what I would call "chipper" and "engaged". Each voice artist is unique in their own ways. The main question, was the voice artist able to "put me in the moment"? Absolutely! I am wanting to hear more of the story. Karen was able to let me see the characters through her eyes. I felt I was there. Nice range of characters. Compelling read. Wasn't expecting what I got but it's very intriguing. Can't wait to start season 2. Will definitely look for more! If you could sum up The Preserve: Season 1.0, Volume 1 in three words, what would they be? This audiobooks reminds me TV series where the contestants try to survive in the jungle. Not a new setting but interesting nonetheless. Very interesting audiobook. What disappointed you about The Preserve: Season 1.0, Volume 1? Where it ended. why break this into two books? should have been just one. Would you ever listen to anything by Josh Hilden again? I dont know. The book was good, just didnt like the lame cliffhanger that didnt need to be. Would you listen to another book narrated by Karen Krause? I thought it is a great premise for a story, however it seemed as tho it was just starting to get good. you are just getting into it then, wham it's over. I will have to get the next books to find out the end? the writing was good. the narration was good. No complaints except the length. on to the next one. If I wouldnt have been assaulted by "F" words. I had two in probably the first few paragraphs. What could Josh Hilden have done to make this a more enjoyable book for you? What three words best describe Karen Krause’s voice? I wish I could say, but barely got to hear. I look forward giving her a try in another book. Warning labels four obscene amounts of bad language.